Cass alumna and her daughter have graduated together at City, University of London. 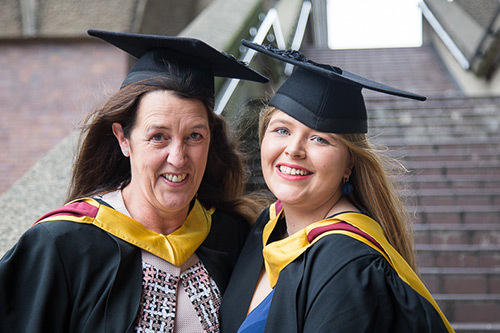 Cass alumna Debbie Pearson (MSc in Charity Marketing and Fundraising) and her daughter, Bridie Pearson-Jones (MA International Journalism) shared their proud moment together at the Barbican, in the first of three City graduation ceremonies scheduled for the week. Debbie, who sat in the audience watching her daughter take the stage before she graduated herself, said: “I left my job in BT as I wanted to work in the charity sector, and when I heard that I could do a degree on charity with Cass, which was head and shoulders above the other options, I immediately applied. “It is an amazing coincidence that we have got to do this on the same day, as it was completely out of our control. I remember when Bridie told me the date that she would be graduating and I realised that we had both received the same email! Bridie said: “As City has the best journalism department, it didn’t even occur to me that my mother was studying here when I applied. I have always wanted to be a journalist, and when I was doing my undergraduate degree everyone always said that studying at City would be the best way into the industry. “I am really proud of my mum, as she has had to balance her career and education while looking after me and my brother. It felt good to watch her take the stage, she did not trip and she may have even stole my thunder! “Not many people get to see their parents graduate, as it is usually the other way round, so this is a special moment for us.